Once upon a time, the corporate learning environment was bursting with boring presentations filled with too many words, occupying too many slides. Most of the instruction was lecture-style, delivered face-to-face in a classroom where the learners role was to sit still and listen. Fast forward to today, and learning and development (L&D) professionals now have a myriad of tricks up their sleeves to adapt to the ever-changing needs of both the learners and the environments they are training in. Through new studies around the neuroscience of learning, L&D professionals are now armed with data to prove that the old-school world of training delivery is not effective. With e-learning, video-based learning, microlearning, gamification, action learning, social learning, and a forever growing list of new trends, L&D professionals have now entered a new world with endless possibilities to engage learners. Although these new trends have opened the door for a diversified learning strategy, augmented reality (AR) and virtual reality (VR) in corporate learning has taken center stage in the immersive learning space. The road here has not been easy, but the road ahead will be much easier with data, information and technology guiding the way! The story begins with static learning delivery methods infesting most corporate learning environments. The true measure of success for a training program was a post-evaluation asking if the learners liked the class. If the class was full and people liked it, everyone was happy! With the move to new ways of measuring learning outcomes, like Phillips ROI Methodology, the focus changed to knowledge transfer, behavior change and proving ROI. L&D professionals had to re-think not only delivery methods but how to measure beyond the smile sheet. Looking at the training process as a whole and determining if lecture-style training created knowledge transfer and behavior change, several studies came out from the world of education showing that it did not have the impact intended. In a study published in the “Proceeding of the National Academy of Sciences” journal, researchers found an increase in examination scores for those participating in active learning versus those attending lectures. In the same vein, Terry Aladjem stated in Harvard Magazine that active learning helps facilitate moving information from short-term to long-term memory. Research data has proved time and again that L&D is evolving. L&D professionals are now faced with new expectations around learning platforms, social integration and real-world scenario-based learning. Driving these new expectations is a new generation of workers. There are approximately 80 million millennials currently in the workforce, and by 2025, three out of every four workers will be millennials. According to the Journal of Organizational Learning and Leadership, millennials’ traits related to innovation and exploration are best enhanced through active learning. Millennials are playing a major role in the revamped learning strategies taking place in many organizations right now. There is no time to waste. Not being on top of emerging learning technologies and trends means a widened skills gap and unskilled workers taking the helm. Research data has proved time and again that L&D is evolving. As L&D professionals begin to grasp what the new world looks like, there are a couple of trends that are leading the charge. Augmented and virtual reality are popular terms in the gaming industry that are now popping up in the corporate learning space. Sometimes used interchangeably, AR and VR are quite different in their functioning and purpose. With AR technology, you are in your own real-world environment with added virtual elements such as graphics, labels, sounds, and even sensations. This allows for a layer of interaction between your world and the virtual world. For example, Agco, an agricultural equipment manufacturer, is using AR technology as part of their on-the-job training program. Virtual elements are layered through the wearable headsets that enable workers to scan a serial number and see the operating manual, a photo, or even a video on that particular piece of equipment. This allows new hires to look at critical information through their wearable device, while training with new equipment. Through the use of wearable technology, Agco has reduced the learning curve for new hires by 50 percent. They are also using AR to improve team collaboration and efficiency of quality inspections. The employee is tasked with making decisions along the way, and with the help of branched outcomes built into the program (built with STRIVR), is able to see the immediate impact on the customer. Empathy training in this type of immersive environment allows the trainee to visualize a customer’s situation and reaction, allowing for a greater mind-heart connection to the training. With new industries testing AR and VR technology every few months, the benefits now range from meeting soft skills competencies, as tested by Fidelity Labs, to meeting complex skill requirements, as proven by Agco. Here are just a few potential benefits in putting trainees in a real-life immersive learning environment. AR/VR allows trainees to practice high-skilled complex tasks in a simulated environment with opportunities to make mistakes and receive real-time feedback during the training process, which reduces on-the-job mistakes. For example, Osso VR allows orthopedic surgeons to practice via surgical simulations in a highly realistic environment to supplement the limited ability to practice on cadavers. 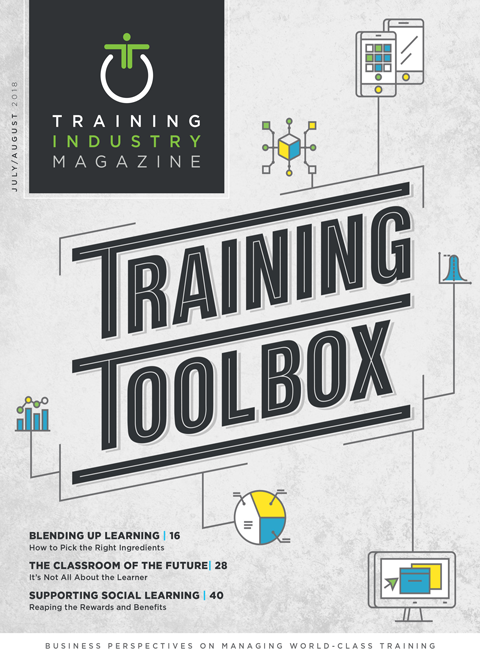 With a dispersed workforce, flying trainees to one centralized training location can be expensive, but trying to train remotely can cause a disconnect with engagement from the remote trainees. AR/VR allows engagement with the learning to take place from anywhere in the world. For example, AGL Energy Limited uses VR for inducting new employees (from anywhere in the country) on “Welcome Day,” by immersing them into a stand-up meeting and viewing the company headquarters in Sydney, Australia. AGL’s future goals are to use VR technology for office learning and development, on-site safety training and communication. Organizations are constantly trying to find quicker ways to get things done without sacrificing quality. Yet our training practices don’t often match these goals. Providing training opportunities outside of a trainee’s real environment can lead to inefficiencies in how the work ultimately gets done. Real-world, on-the-job training creates linkages for the learner and puts the information in context, while AR technology allows the reinforcement of the learning to happen as it is needed. For example, Boeing uses Microsoft HoloLens to show engineers how to put pieces of equipment together using 3D models. Supplemental information appears in text form with a voice-over to guide the engineer along the way through the smart glasses. Boeing anticipates cutting training time by 75 percent per person using AR technology. Although several validated benefits exist to implementing AR/VR into a corporate learning landscape, there are a few challenges that serve as roadblocks to further adoption. The price point for AR/VR devices can be upwards of $3000 per unit (HoloLens) to as low as $200 per unit (Oculus Go). Companies must also factor in the cost to produce the videos, pictures, sounds and models that make up AR/VR experiences. Most companies do not have an in-house expert creating AR/VR experiences and need to hire a third party, with costs ranging from $50,000 to $1,000,000, depending on the complexity of the experience, features and design requests. VR devices may leave certain users nauseous, dizzy and disoriented, with some users getting headaches and feeling a general discomfort after using a device. The VR users affected use common cures for motion sickness to help with these side effects. With AR/VR being first known as a cool new gaming technology, overcoming that stigma to now being used as a corporate learning tool will not be an easy hill to climb. Although oil and gas, manufacturing, automotive, aerospace, legal services and health care have taken AR/VR technology and shown results from their use, other industries are more hesitant to invest in this type of technology without further studies and proof of the ROI and impact. Constructing a new world that includes AR/VR technology in every corporate learning strategy is right around the corner. What once was imagined as a futuristic idea has now become a tangible real-world option for delivering immersive, real-time, experiential learning experiences anytime, anywhere. In the new digital era, L&D professionals are better equipped to provide experiential learning experiences through advanced technology and learners are ready and waiting to experience it! Want to learn more? Join Elizabeth for her session at the free upcoming TICE Virtual Conference: Emerging Technologies in Corporate L&D. Elizabeth Greene is the director of global learning and development at On Semiconductor with 15 years of experience in reinventing corporate learning programs.